The Under Armour building at 2815 SW Barbur, as approved last year. Every week, the Bureau of Development Services publishes lists of Early Assistance applications, Land Use Reviews and Building Permits. We publish the highlights. 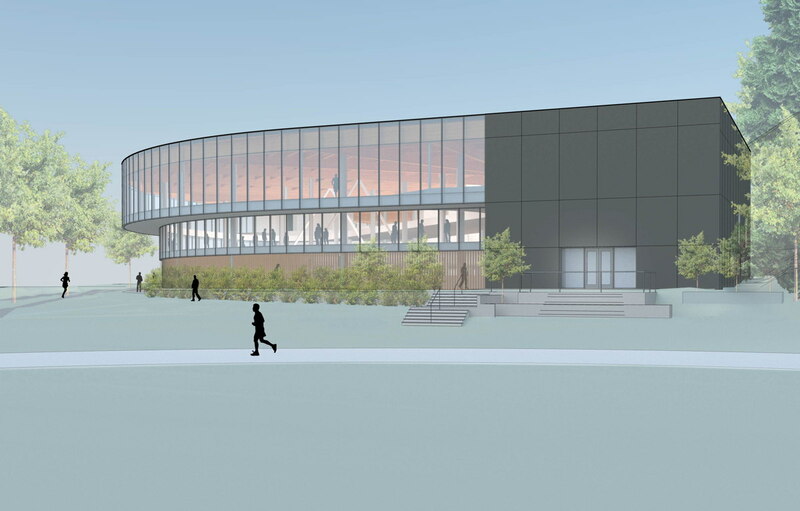 Proposed addition to building that is currently undergoing a change in use. Proposal is to build a four story wood framed multi-family apartment building with 15 dwelling units and five parking spaces. Proposed 4-story Motel 6 with surface parking. Proposed mixed-use housing project with approximately 175 units. Will meet community design standards. Proposed 8-story mixed-use office and retail building. Multi-family dwelling building with parking below. Convert existing building from Warehouse and Industrial Service Use to an Office Use in the IG1 zone. Core and shell build out of 78,246 sf of 108,066 sf building, for future tenants; add new interior walls to create 10 tenant spaces, lobby area, restrooms, bike storage area; and new stairs that lead to mezzaninne; voluntary seismic upgrade. No occupancy this permit. Separate tenant improvement permits required. New construction of a 6-story 59unit apartment building including parking and retail on level 1. Levels 3-6 contain a mix of apartment including studios, 1 bedroom, and 2 bedrooms. Level 6 also has an amenity deck along the west property line. Retail space on level 1 is to be built out under a separate permit with no occupancy this permit. Demo of existing building to be under separate permit. Demo plans included for reference only. This entry was posted in 11144 NE Sandy, 1120 SE Madison, 121 N Beech (2016), 129 SE Alder, 2815 SW Barbur, 3403 N Mississippi, 5416 NE 14th, 606 NE 20th, 6404 N Montana, Ankrom Moisan, Bora Architects, Brett Schulz Architect, Cathedral Flats, Holst Architecture, Iron Fireman, Mackenzie, Metro Reports, Otak Architects, Skylab Architecture, Studio 3 Architecture, SW Broadway and 9th, The Hub at 3423 SE Hawthorne, Works Progress Architecture, Yard. Bookmark the permalink. Interesting that Skylab has requested changes to the Yard. How significant could these be? I don’t expect we will ever get something as good as the rendering, but that building could really use some help. I agree 100 percent. Every time I walk or drive by this Yards, It seems to look worse, as far as quality of materials and the reduced about of windows that seem to be non reflective. A real disappointment. I thought it looks more interesting when is was in its cement shell with the construction lights on at night!